Professor Juneja joined the faculty of Valparaiso University in 1978. Professor Juneja has published a book, “Caribbean Transactions: West Indian Culture in Literature” (1996) and more than two dozen scholarly articles, in addition to being a regular contributor to the Valparaiso University publication, The Cresset. Her teaching and research interests include Shakespeare, 16th and 17th-century literature, postcolonial literature, drama, Bollywood cinema, and women’s and international studies. 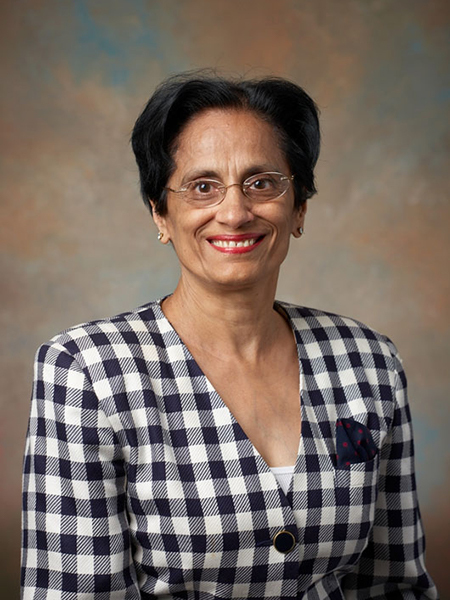 Professor Juneja served as Associate Provost of the University for more than 20 years. She has also served as Chief Diversity Officer for the university, and has contributed heavily to the internationalization of the university. “Caribbean Transactions: West Indian Culture in Literature.” London: Macmillan Caribbean, 1996. “The Caribbean-American Connection: A Paradox of Success and Subversion,” journal of American Culture, 21.3 (Fall 1998): 63-67, with James Kingsland. “Contemporary Women Writers,” West Indian Literature, ed. Bruce King. London: Macmillan, 1995, 89-101. “Pedagogy of Difference: Post-Colonial Literature in the Undergraduate Curriculum,” College Teaching 41.2 (Spring 1993): 64-70. “Barefoot in Spirit: The Plays of Derek Walcott,” Post-Colonial Drama, ed. Bruce King. London: Macmillan, 1993. “Spirited Bodies in Earl Lovelace’s The Wine of Astonishment,” Reading the Social Body, eds. Catherine B. Burroughs and Jeffrey Ehrenreich. Iowa City: U of Iowa Press, 1993, 202-217. “Culture and Identity in Lovelace’s The Wine of Astonishment,” Imagination, Emblems, and Expressions: Essays on Latin American, Caribbean, and Continental Culture and Identity, ed. Helen Ryan-Ranson, Bowling Green UP, 1993, 191-212. “Native and the Nabob: Representations of Indian Experience in 18th Century English Literature,” Journal of Commonwealth Literature 27.1 (1992): 183-198. “Recalling the Dead in Dennis Scott’s Echo in the Bone,” Ariel 23:1 (January 1992): 97-114. “Representing History in Ismith Khan’s The Jumbie Bird,” World Literature Written in English 30 (Spring 1990). “We Kind of Music,” Popular Music and Society 13.1 (1989): 37-51. “Widowhood and Sexuality in Chapman’s The Widow’s Tears,” The Philological Quarterly 67.2 (1988): 157-175. “The Trinidad Carnival: Ritual, Symbol, and Performance,” The Journal of Popular Culture 21.4 (1988): 87-99. “Identity and Femininity in Anita Desai’s Fiction,” Journal of South Asian Literature22.2 (1987): 77-86. “Audience Manipulation in Jonson’s Comedies,” Ball State Forum 25.2 (1984, published 1986): 29-41. “Rethinking About Alchemy in Jonson’s The Alchemist,” Ball State Forum 24.4 (1983, published 1985): 3-13. “Women in the Plays of Mohan Rakesh,” Journal of South Asian Literature 19.1 (1984):181-92. “Myth and History in Modern Indian Drama,” South Asian Review 7.4 (1984): 27-36. “Widow as Paradox and Paradigm in Middleton,” Journal of General Education 34.1 (1983): 3-19. “Women and Patriarchy in the Theban Plays of Sophocles,” Illinois Quarterly 44.1 (1981): 10-21. “The Unclassical Design of Jonson’s Comedy,” Renaissance and Reformation ns 4.1 (1980): 74-86. “Two Modern Indian Dramatists in Search of Tradition,” South Asian Review 4.1 (1980): 37-45. “How the Woman Becomes Contemporary in Amrita Pritam’s Fiction,” South Asian Review (July 1979): 18-26. “Eve’s Flesh and Blood in Jonson’s Bartholomew Fair,” Comparative Drama 12.1 (Winter 1979-80): 340-53. “Denouement in Jonsonian Comedy,” Jacobean Drama Studies 76 (1978): 3-23. “The Framework of Romance: An Analysis of Two ‘Realistic’ Comedies of Middleton,” The Indian Journal of English Studies 16 (1975-76): 164-71.